When deciding to have a 24 hour stopover in Iceland I knew the one thing I wanted to do was a northern lights tour, but when it came to booking a tour I was at a complete loss due to the sheer amount offered. 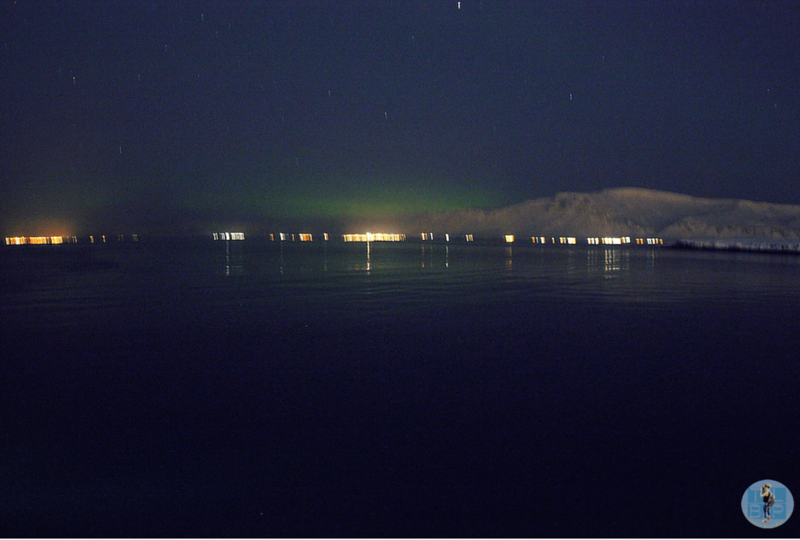 Narrowing it down a little by choosing to stay in Reykjavik didn’t really help. After being recommended Reykjavik Excursions for tours and trips around Iceland I decided I would just choose from one of their tours. From there the choice was easy due to the price, however you could literally go on any kind of tour you had the money for there are that many choices. In the days leading up to our flight to Iceland and the northern lights tour I was frantically checking the aurora forecast and weather forecast for chances of the tour going ahead/lights being seen. I didn’t want to get my hopes up knowing people can spend two weeks on the island and still see nothing but I was still crossing my fingers. When the tour wasn’t cancelled I finally allowed myself to get excited. The tour we had chosen was a boat tour run by an outside company called Special Tours, they picked us up from our accommodation and dropped us off at the boat. After exchanging our ticket at the desk we were directed over to our ride for the evening, a mighty looking boat named Andrea. Once everyone had piled on board and found a seat on the various decks the tour began, our guide chatted to us as we cruised out of the harbour. Talking about sights of interest on our exit and a few safety tips for the night, he didn’t hold back on the jokes either and had the whole boat in giggles several times. It felt like we had barely been on the boat when we were informed of the first sighting, at this point we were still tucked up in the warm, inside. Quickly scrabbling together our coats, hats and gloves we bounded up the stairs to the top deck of the boat. I quickly looked in the same direction as everyone else and spotted the faint green glow in the sky, finding ourselves a little spot, I went about snapping some pictures. Unsure of the camera settings at first, it took me a while to take a decent shot, but you could clearly see the green of the aurora borealis on every photo. I quickly found myself getting cold and went to investigate the brightly coloured onesies people seemed to be wearing. 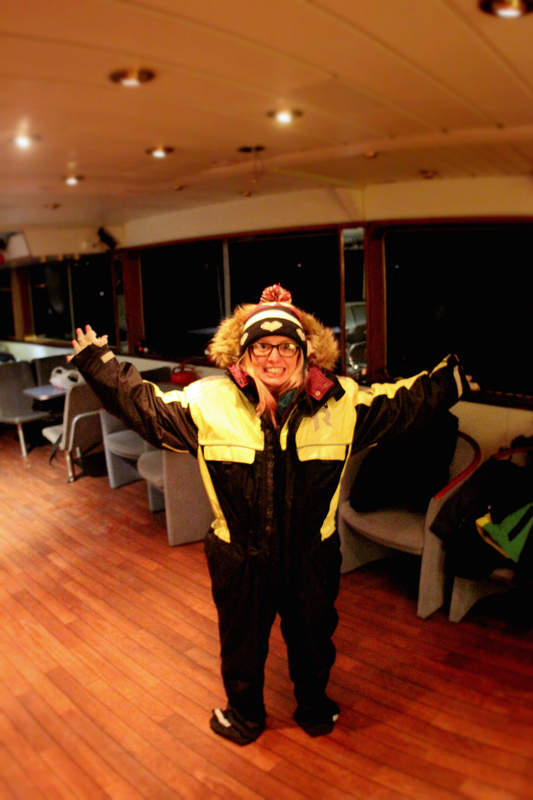 Located on the bottom deck of the boat were racks and racks of very warm overalls for us to wear. Searching through I managed to find a small and haul myself in to the eskimo like suit. I was pretty toasty for the rest of the night after that. 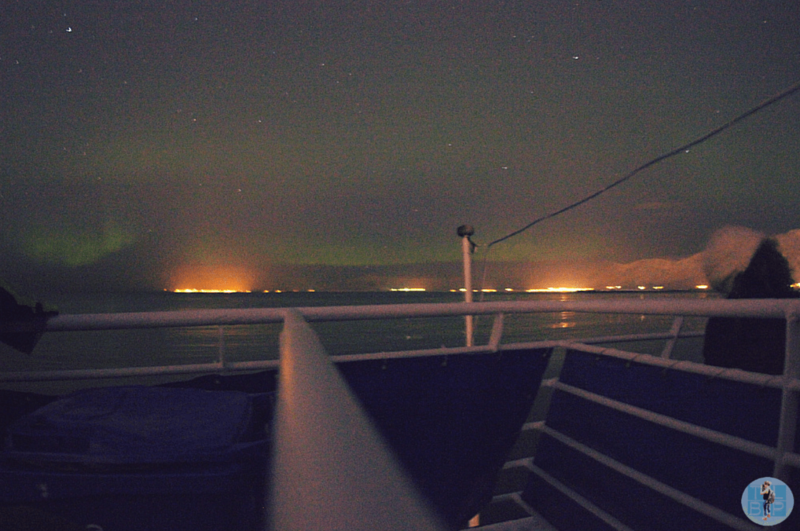 During the two and a half hour trip we spent the majority of our time outside on the top deck, staring at the sky and continuously checking the stars for guidance of north, as the boat seemed to slowly spin around. I felt like you had to really concentrate on the sky to actually see anything. Even looking at the screen on the camera meant I had to spend a few minutes readjusting my eyes to the sky again. The high concentration was probably due to the faintness of the lights that night, however that didn’t bother me so much especially when I actually noticed how strong the green was being picked up on my camera. What did bother me and was something I had failed to think about when booking the tour was the rocking motion that we were feeling at sea. Trying to take a picture which needs exposing for multiple seconds is difficult when the boat is rocking up and down constantly. The boat stayed placed in the same location for the majority of the tour and for the first time since landing we were finally able to pick out some mountains and general shape of the landscape. As the evening wore on we pottered about the boat, enjoying a complimentary hot drink to warm up and heading up top if a sighting call was given. As the tour was nearing an end we wandered down to the bottom level to find the guide and another member of crew playing some music on guitars and harmonicas. It sounded very much like the style of my favourite Icelandic artist Ásgeir – slow, funky and insanely good. He kept apologising for his small range of songs due to leaving his music sheets and lyrics behind but nobody really minded. As the engine started up to take us back in to the harbour we regretfully stripped out of our ever so warm onesies and headed back upstairs. The crew announced that due to the poor light display that evening everyone was entitled to another free trip with them, dated for any time. I hadn’t been at all miffed by the light display and throughly respected the crew for giving out complimentary tours. Although the lights didn’t dazzle and I didn’t get postcard perfect pictures from the night, I throughly enjoyed every minute of the trip. 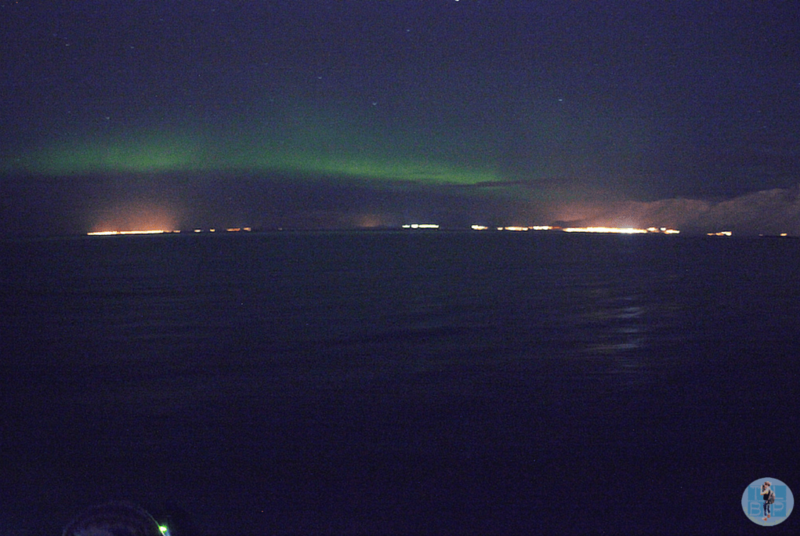 Taking to the water to see the lights was an option I had never considered beforehand but considering cloud cover is often less at sea it seems pretty logical now. The crew on the boat were awesome and the whole tour ran as smoothly as I could have imagined. 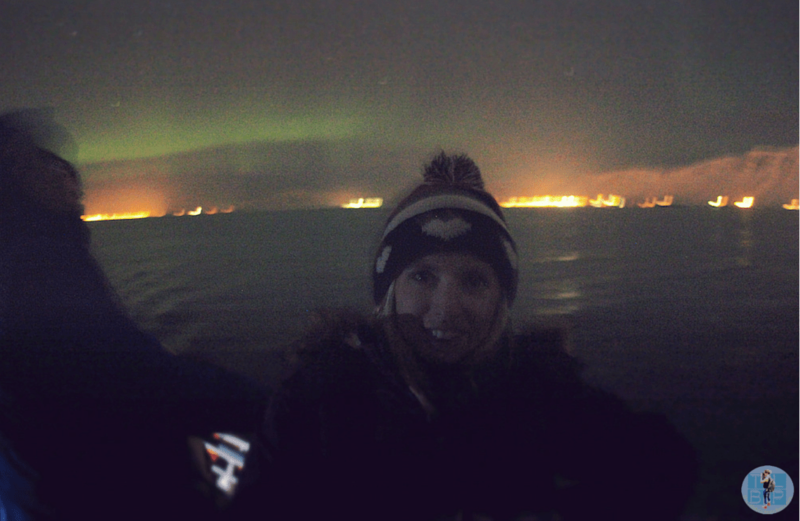 This isn’t the tour for perfect pictures – due to the boat rocking – or getting out in the pitch black wilderness however it is something affordable and a little different from the normal northern lights tours. I would highly recommend this tour for anyone heading to Iceland this winter time. 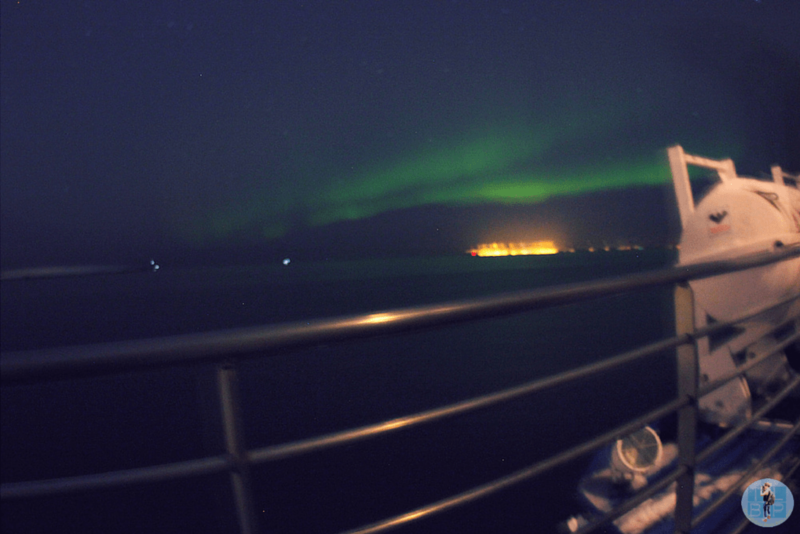 You can book the northern lights boat tour with Reykjavik Excursions and it will set you back 10.000isk. It operates between September and April with departure times varying depending on the month. You can arrange for pick up from your accommodation or to meet the boat at the harbour. The tour provides a hot drink each, warm overalls in various sizes and snacks to buy on board. What type of camera did you use for your pictures? I don’t have a DSLR or a gopro but most forums I have checked recommend either. I’m leaning towards a gopro so that I can take pictures at the Blue Lagoon too! 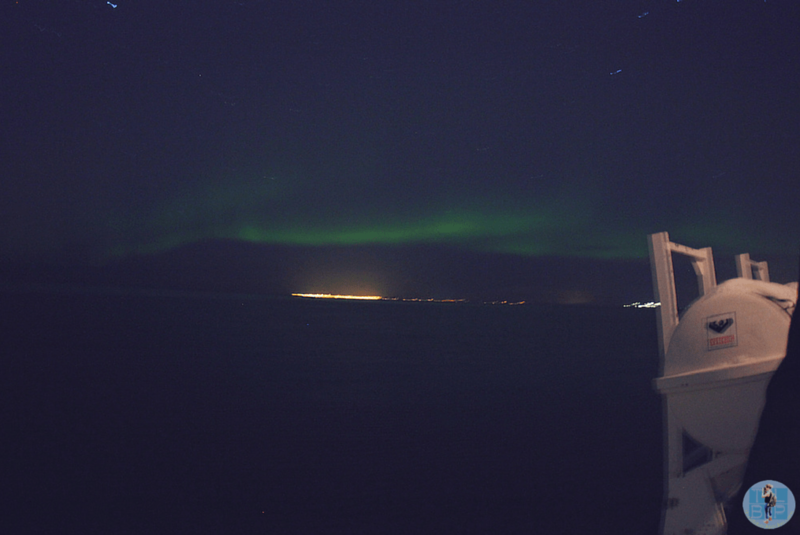 Hi Naheed, If you want to take pictures of the northern lights then you need a camera that allows you to keep the shutter open for a prolonged period. This is something a DSLR offers but I’m not sure about the Go Pro (you’d have to check the specs of the 5, my 3 does not offer this). It does then mean you can’t take it into the water at the Blue Lagoon but there were plenty of people there grabbing a quick photo on their phone and then popping it away. Depends what you want more.. Hope this helps.